Croatia is rich in culture and history, with an array of activities and places to visit not to mention National Parks. 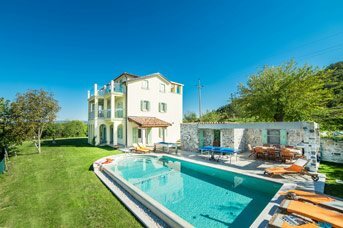 Our villas in Croatia offer something for everyone, whether you’re looking fora great base from which to explore, or comfortable accommodation where you can sit back, relax and enjoy your surroundings. All of our villas are well-equipped and you can choose from something contemporary to the more traditional. Combining crystal clear waters and rugged coastline, Istria in Croatia has become a sought after destination. This villa holiday favourite on Croatia’s Adriatic Coast is a place of unforgettable countryside, culture and cuisine. 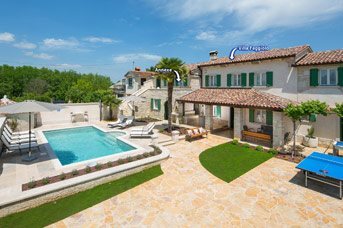 Our selection of delightful villas in great locations mean that you can have the best of the Istrian region whilst enjoying the comfort and convenience of private accommodation and private pool. Istria, the largest Croatian peninsula, is a treasure trove of diversity. There’s lush green rolling hills with small towns perched on hilltops overlooking lush wheat fields, olive groves and vineyards, whilst other resorts are located close to the long picturesque coastline with numerous islands and bays. This, along with the pleasant climate, make it an ideal holiday destination. The Istrian Riviera has some spectacular countryside scenery. The beaches around Istria are mostly shingle with some sandy coves and paved bathing platforms also to be found. All nevertheless great for swimming, sunbathing and snorkelling. The mountains of Istria provide a playground for outdoor enthusiasts in Croatia. The hiking trails in the Ucka and Cicarija mountains are particularly good, and adventure-seekers flock to Vranjska Draga Canyon every year. The beautiful coastline around Istria is not just popular with sunbathers, it’s a big draw for divers too. The new toll road makes travelling through Istria easy which means you can see everything that Istria has to offer. You can also connect to other major highways throughout Croatia if you want to venture further afield. Whichever way car hire is essential for getting around. The villas here range from beautiful, traditional houses made from authentic stone to modern, stylish properties with sleek interiors - something for everyone! The tourist resorts of Pula, Porec and Rovinj all have a rich history with Venetian architecture, churches, beautiful cobbled streets, museums and art galleries to explore, whilst the smaller inland Istrian villages give you a taste of real Istrian hospitality. Our handpicked Croatia villas are equipped with facilities to make your villa holiday as relaxing as possible. Along with staple features like a private pool, satellite TV and air conditioning, we pack more added extras into our villas than other providers. From pool heating to pool tables we have a whole range of things to make your holiday extra special. The villa to suit your preferences is just a few clicks away. Sun worshippers will be completely spoilt for choice of beaches in Istria! The majority of the beaches are either paved or pebbly but a few sandy ones can also be found. The beaches on the whole have good facilities, life guards, catering facilities, watersports etc, perfect for wiling the hours soaking up the sun and enjoying the laid back atmosphere. The resort of Porec, on the western coast of Istria, has a huge choice of beaches and bathing platforms, a wealth of shops and places to eat, and a number of attractions including the church, museums, the aquarium as well as a choice of sporting activities. Pula is the largest city in Istria and is also home to this region’s airport. Situated towards the South of Istria, it enjoys a mild climate and a beautiful countryside. The city has many surviving ancient buildings from the Roman times, the most famous one being the amphitheatre. Rovinj is on the mid-western coast of Istria, roughly halfway between Pula and Porec. Rovinj is known as the pearl of the Istrian Peninsula. If you're feeling energetic, you can take a walk up to the hilltop church in the old town with stunning views over the resort and then relax in one of the marina-side restaurants or cafes. If you’re looking for a holiday destination with plenty to see and do, Croatia is the ideal choice! The area is steeped in history with a number of beautiful churches and architecture to explore. There are also a number of activities and places to visit for a great family day out, fabulous beaches for sun-worshippers, amazing scenery for photographers and sporting facilities for anyone wanting to try their hand at something more active. Located in the heart of Rovinj, the Church of St. Euphemia has an impressive display of Baroque architecture and artwork and is also home to the sarcophagus of the patron saint of the city, St Euphemia herself! Without a doubt, the main attraction of Pula is the magnificent amphitheatre, the sixth largest in the world. Originally designed and built to be a gladiatorial venue, the amphitheatre is now used as a setting for concerts and theatre productions. There are 2 good waterparks in Istria: Aquacolors Waterpark and Istralandia Waterpark, both around 30 minutes drive from the centre of Porec. Both parks have a great atmosphere and cater for all ages with pools, rides and slides galore! Please note, Aquacolours is open in high season only. Fazana is a picturesque coastal town, just above Pula, on the western side of Istria. It has a lovely pebble beach with several cafes and gift shops leading up to the small port from which you can catch the boat across to the Islands of Brijuni. Located just south of Porec, on the far west coast of Istria, is the area of Funtana. Here you'll find several good beaches and bathing platforms by the sea, perfect for swimming and sunbathing. Most of the areas around the seafront have deck chairs and sunshades for hire, as well as snack bars or cafes. Just north from Porec, the area of Lanterna has several good beaches, as well as a popular camping resort. The main Lanterna Beach has pleasant views across the other side of the inlet towards the church at Novigrad. Parasols and sunbeds can be hired - perfect for a relaxed day by the sea. Hotel Delfin Beach, in Lanterna, is situated below the Hotel Delfin. The beach is mainly paved, on various levels, and has life guards and a cafe. Robinson Crusoe Beach in Lanterna, is a unique shingle cove, ideal for a laid-back day by the sea. The beach is accessed via a long driveway, with plenty of parking, and there's a good snack bar with seating byt he seafront too. Valeta Beach is located on the edge of the north-western part of Lanterna. The beach is pebbly on one side, paved on the other, with a small lawned area in between, perfect for sunbathing. There are also restaurants, toilets and sporting activities all nearby. Medulin's long, thin sand/shingle beach sits on the South Coast of Istria, 20 minutes' drive from Pula. Sunbeds and parasols can be hired and pedaloes can be hired in the summer. There are also a few bars and cafes at the back of the sand where you can take a break from the heat. The area of Premantura sits on the southernmost tip of Istria. There are various shingle beaches around this area of headland, which tend to be more rugged, but are still ideal for sunbathing. Sunbeds, parasols and pedaloes can be hired, plus there are watersport facilities nearby too. The Verudela Peninsula, 2km South of Pula centre, is the place to go if beach fever grabs you! The beaches are mostly rocky or paved but the water is ideal for swimming for all ages and capabilities. Valkana, Hawaii and Kolumbarica beaches are the most popular and Debeljak is the best sandy beach in the area. A choice of watersports can also be found at most of the beaches here, along with cafes or restaurants for when you decide to take a break fromthe sun! For serious beach-goers, take a boat from Pula across to the island of Brijuni which has a spectacular beach with beautiful scenery. Almost every beach in Rovinj is made of either pebble or paving, but the entrances into the water are good and swimming is still very popular along this area of coast. There are many small hidden rocky bays and platforms that you can explore and make your own little haven! The bays of Skaraba and Cape Rusi have high rocky areas, popular with people wanting to jump into the sea, while Cuvi Bay, Lone Bay and Moulin Rouge Beach have a flatter appearancewith fine stones, much better for sunbathing and swimming. Sport and food facilities at most of the beaches are good, as well as parking for your hire car and many also have a lifeguard in high season. Valbandon Beach has a beach bar, sunshades and deck chairs to rent, showers and a children's playground. Giant inflatables are also available in the summer. Vrsar is situated between the maincoastal resorts of Porec and Rovinj, right by the entrance to the Lim Fjord Estuary. There are a few good beaches around this part of the coast, with sunbeds and deck chairs for hire, as well as inflatables and pedaloes in the summer. The food and cooking will vary from one region of Croatia to another. Croats generally pride themselves in their hospitality, both in restaurants/cafes or in their homes. They prefer to buy fresh ingredients from their local markets and every village and town in Croatia has its market where the local people visit daily. As a tourist, when you are strolling through these markets, which are typically held in a village or town square, you will get a glimpse into the day-to-day life of the locals. The markets are very colourful with the fresh produce of vegetables and fruits. The markets also have stalls for fish, meat, cheese, bread, wine and even handmade baskets or tablecloths. Croatia might not be known as a major shopping destination when it comes to designer names and high street brands but, at its heart, Croatian shopping isn’t really about these things. In this country of sunshine, natural beauty and antiquity expect good local markets, a trendy arts and crafts scene and a thriving natural cosmetic industry. Keep your eyes peeled around Croatia’s open air markets and specialist shops and you should come home with truly unique souvenirs. You will also find that Croatia has many excellent wine shops and fresh fish, while local vegetables and meats are never too hard to find either. 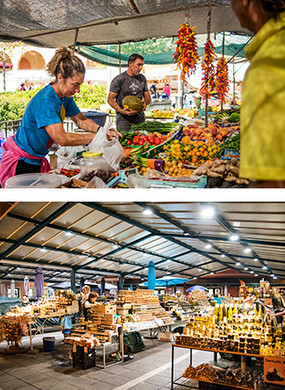 On your villa holiday to the resort of Pula, Porec or Rovinj, plan a day out visiting the local markets. The market in Porec is very colourful with all the fresh produce laid out across the stalls. It is busy with stallholders, local people and tourists, adding to the experience and atmosphere. You will need to get there early to see the place in full swing – if you find some stalls shut, it could be because they have sold out for the day. Istria is popular for lavender products, and in Porec you will find these in small fabric bags - perfect to bring home as a souvenir. The market in Pula is bigger than the one in Porec. The traders provide fresh produce daily between 6am and 1pm. The traditional shops all line the streets facing the main square and some of the souvenir shops can be quite hidden away. The Art Nouveau is a market building where you can buy meat, fish and any of the local specialities. It was built in 1903 and is an architectural attraction in Pula. The greens and fish market in Rovinj is close to the main square. Fruits and vegetables produced locally are sold here and in the fish market you will find the catch of the day. Elsewhere in the town you will find small shops selling handmade jewellery, clothes, souvenirs and artwork. The dishes in Croatia can vary by region. Meat dishes, which can be either grilled, baked or roasted, are very common and soup is eaten with almost every main meal all year round. The location of Croatia also lends itself to excellent fish and seafood dishes. Special traditional breads are made for special occasions like Easter. Istria is very famous for its truffles. Brodet– is a fish stew that is made with mixed fish, normally including eel. It is usually served with polenta or rice. Fritaja– is a kind of omelette made with vegetables, herbs and sometimes meat. 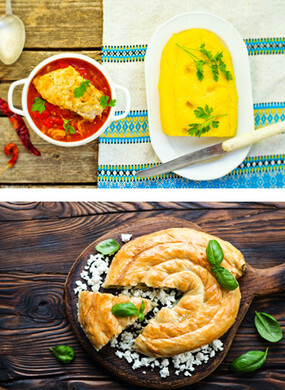 Burek– is a baked pastry dish that contains numerous layers of filling and pastry – the most common fillings are ground meat, spinach and cheese, although you can also find sweet options. This dish originates from Turkey but is very popular in Croatia and is a light meal to buy and eat when you are out and about. If you’d like to give some local recipes a try before you set off on holiday, these traditional delicacies can be made at home easily. 1. Beat eggs with a pinch of salt. 2. Gradually add flour, milk, and mineral water until the mixture forms a thin batter. 3. Heat a small amount of oil in a small frying pan. Pour about ¼ cup of batter into the pan and cook the pancake until small holes appear in the surface. 4. Loosen the edges of the pancake and flip it over carefully. Cook on the other side about 30 seconds. 1. Separate eggs, pouring the yolks and whites into two different bowls. 2. Beat egg yolks and sugar together until thick. 3. Add grated peel from a lemon. 4. Beat in softened cream cheese. 5. Beat egg whites until they hold stiff peaks. 6. Carefully fold (mix using a gentle stirring motion) egg whites into cheese mixture. 1. Spread about 2 tablespoons of filling near one side of the pancake. Roll the pancake up to enclose the filling. Place the filled pancakes, side by side, in a buttered baking dish or casserole. Keep warm in a 250° F oven until ready to serve. 2. Serve warm. 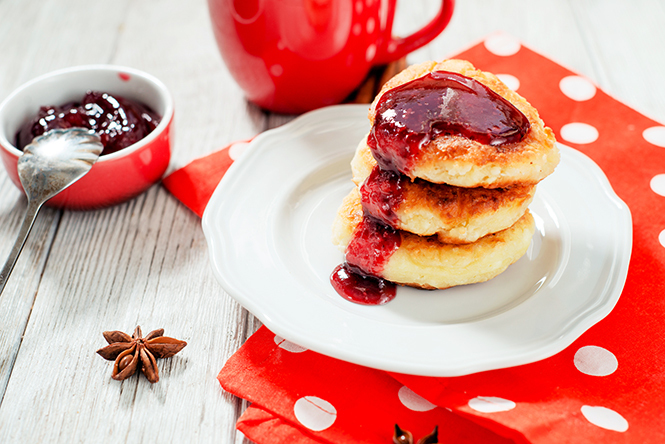 May be topped with jam (a Croatian favourite is plum jam), powdered sugar, or sour cream.